Customers get discounts for repairs with Seats Visa credit card. 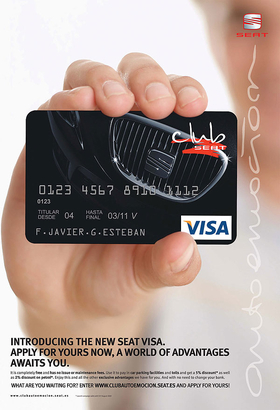 Volkswagens Seat brand could expand its customer credit card from Spain to other European markets. The Spanish carmaker started offering a credit card to customers in its home market late last year. Seat hopes the initiative will help its dealers win more repair work to offset the loss of new-car sales during the current economic downturn. Seats global sales fell 14.6 percent to 368,100 in 2008 compared with the year before. About 1,000 customers have signed up for the Visa card, which is being offered through Santander Consumer Finance. Seat aims to issue around 20,000 cards in Spain this year. After that we will look at introducing the card in other countries, Salinas said. The card offers customers interest-free financing from three to six months for vehicle repairs and parts purchases in Seats authorized service network. Credit is difficult to get at the moment, so this could spread out the payments. If you have a crash and have to pay 2,000. Thats a lot of money, Salinas said. He said the card would also enable Seat to improve its customer relations.